LANGLEY — Some late finishes, some tardy coaches, some e-gremlins. Put them all together and you’ve got a bonus Saturday morning edition of Varsity Letters’ B.C. High School Football Report. We’ll be back in the later p.m. with updates from today’s three AAA contests (full schedule below) which wrap up the 2018 B.C.high school football regular season. The Archbishops’ Trophy clash, a new program record for the Terry Fox Ravens, the new ‘star’ of Northern Conference football, a Pac Conference title for the Hub City’s Islanders, and the thoughts of Mission head coach Danny Jakobs following his team’s tough tale-of-two-halves loss to the St. Thomas More Knights. BURNABY — The Vancouver College Fighting Irish (8-1, 7-0) have up bigger numbers on most every other weekend of what is beginning to look like an historic season in the making. Yet you’d be hard-pressed to find, among its nine-game 2018 canon, a contest in which it better blended its ball-control DNA with its ability to cash in on opportunity as Friday’s decisive Archbishops’ Trophy win over the host Notre Dame Jugglers (7-2, 5-2) at Burnaby Lakes. Start with possession off the opening kick-off, a resulting 12-minute drive capped by a 17-yard pass from quarterback Eric Zychlinski to receiver Connor Louis, then a fumble recovery off the ensuing kick-off which turns into a one-yard TD keeper by Zychlinski. Notre Dame, which lost for the second straight wee after winning their first five straight in the conference, didn’t touch the football on offence until 2:31 remained in the quarter. After the Jugglers responded with a five-yard touchdown run by Teon Alexander-Amour to make it 14-6, the Irish’s Louis caught a seven-yard TD strike from Zychlinski for a 20-7 lead. Notre Dame, however, rode a six-yard Jerrell Cummings’ touchdown run late in the second quarter to close the halftime deficit to 20-14. The second half was all Irish as Vancouver College headed to a playoff bye next weekend by scoring its final 21 points in unanswered fashion. “Defensive adjustments in the second half by (veteran defensive coordinator) Ron Turner and company secured the second-half shutout for us,” said Irish head coach Todd Bernett. Zychlinski, picked the Game MVP, scored on a six-yard run and finished his night 10-of-11 for 149 yards, two touchdown passes and no interceptions. Aiden Perry on a nine-yard run and John Calica from three yards out, rushed for majors to round out the scoring. Basil Schincariol carried 14 times for 88 yards to lead the Irish ground game. “Basil ran behind his pads with force and quick feet,” noted Bernett. The game’s Outstanding Lineman was Simon Smith of Vancouver College, while Notre Dame quarterback Will Clarke, 2017’s Game MVP, was picked Outstanding Back. BURNABY — Ricky Parsons helped the St. Thomas More Knights make a comeback few would have thought possible. Gutsy Mission (4-5, 4-3) took leads of 16-0 at the end of the first quarter and 22-8 at halftime, but on the road, against B.C.’s No. 2-ranked Knights (8-1, 6-1), they weren’t able to hold the fort. “We came out and established the line of scrimmage early,” admitted Mission head coach Danny Jakobs who saw Jackson Trask, Keegan Royal, and Alec Bolland all score on short runs within the Knights’ five-yard line, one of which was set up by a Tyson Bongo interception. On the opening drive of the second half, Knights’ quarterback Dario Ciccone hit receiver Michael Simone with a 38-yard completion to help set up the pivot’s 10-yard TD run. After the convert, STM trailed 22-15. Mission, however, moved the ball down to the Knights’ five-yard line. On fourth-and-goal, however, Parsons picked off a pass on the goal line and returned it 100 yards for the score and knot the game at 22-22. Then, in the fourth quarter, with Mission again driving deep, Parsons stripped the ball loose for teammate Colin Dalla-Vecchia to recover. Just a few plays later, Ciccone hooked up once again with Simone, this time for a 20-yard TD. Ciccone ran in the convert to close out the game’s scoring. Ciccone went 10-of-12 for 130 yards and two touchdowns, while rushing for 30 yards and another. Simone caught five passes for 90 yards. Marc Abboud’s lone carry went for 75 yards while Julian Valerio rushed seven times for 70 yards. On the defensive side, Parsons had six tackles to go along with his 100-yard interception return touchdown. Jack Wagner and Daniel Auld also made six tackles each. For Mission’s three touchdown scorers: Royal had 15 carries for 117 yards, quarterback Trask nine carries 57 yards, and Bolland five carries for 36 yards. Bongo caught four passes for 95 yards, while Cody McMahon (five tackles, one sack) and Mike Guitard (seven tackles) led the defence. COQUITLAM — Five touchdowns from star Jaden Severy helped the 2018 Terry Fox Ravens etch a place in program history on Friday. Severy rushed for three touchdowns as part of a 125-yard performance along the ground, caught a 43-yard touchdown pass and found the end zone via pick-six as the Ravens (8-2, 5-2) set a new school record for points in a game, surpassing the former mark of 79, with a win over Centennial (0-8, 0-7). The statistical highs were evident throughout the line-up. Liam Cumarasamy rushed for a 13 yards and registered 13 tackles. Ethan Shuen blocked two punts and took one in for a score, as well as making two interceptions, one of the pick-six variety. He also rushed for 43 yards and a score. Jack Kristmanson caught a 58-yard touchdown pass and Layth Begg not only turned his own blocked punt into a touchdown, but six of team-high 16 tackles resulted in negative Centaur yardage. Alex Malcic had two interceptions, one of which went for a 25-yard touchdown. NANAIMO — The host Islanders (8-1, 7-1) captured the Pacific Division title on the final weekend of the regular season behind a balanced attack that yielded 208 rushing yards and two touchdowns, and 150 passing yards and three touchdowns. Mike Megla, with four tackles, and Liam Colbourne with a pair of interceptions, led the winning defence which recorded its third shutout of the season. PRINCE GEORGE — The Prince George Polars have reached Subway Bowl as Northern Conference champs. 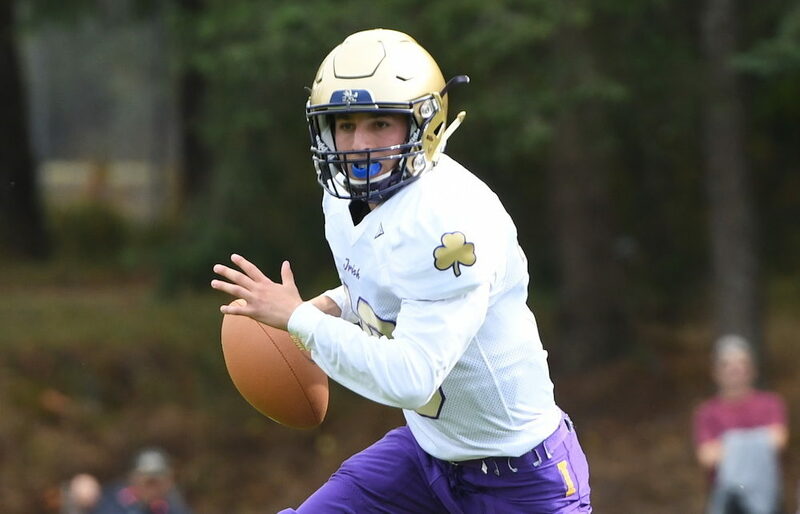 Quarterback Braden Reed carried 28 times for 266 yards and five touchdowns on Friday as PGSS topped the rival Kelly Road Roadrunners in the Prince George Bowl to win the Matt Pearce Memorial Trophy. “We came out with purpose and execution,” said Polars head coach Brett Morrow. “Braden Reed is a really good football player but an even better young man off the field. When we brought in the triple-option this year, he embraced his new role at quarterback and he’s just kept on improving. After a booming punt from the Roadrunners had pinned the Polars at their own four-yard line, PGSS set a trend by going 96 yards for the major, and scored on each of their first four possessions to lead 28-0 at half. Gavin Murray had 22 carries for 117 yards and a touchdown while Alexander Macpheat had six carries for 20 yards and a score.